This is Part 1, the “Why” or “Justification” for Value Selling. I’ll talk about the “How” next week. But come on!!! Really??? Value Selling needs to be justified??? Apparently so, because sellers don’t do it, at least not from buyer perspectives. And let’s be real, their perspective is the only one that matters. Everything needs to be justified, but Value Selling (or whatever you’d like to call it) is not only justifiable, it is essential to high performance. Can we live without it? Sure we can; we do so every day. Depending on the survey, buyers say we live without it between 80% and 93% of the time. And buyers don’t like it! And they don’t buy from us because of it! will yield tremendous returns when actually done! Forrester – B2B buyers say 80% of sellers have “what we sell” perspective, 7% have good buyer perspective, 13% are trying. CSO Insights (2015 Sales Performance Optimization Study) – Companies lose over 53% of the deals their sales organizations forecast to close, in large part due to lack of customer alignment and articulation of value. Most of those are negative statistics, but the positives of doing so are plentiful, and enormous in impact. For instance Matt Dixon of CEB (author of The Challenger Sale) says buyers are 26% more likely to buy from sellers who communicate value messages that are personalized to the buyer and their business. Needless to say, the justification is enormous and execution is spotty at best. In our businesses we should give this a tremendous amount of attention. 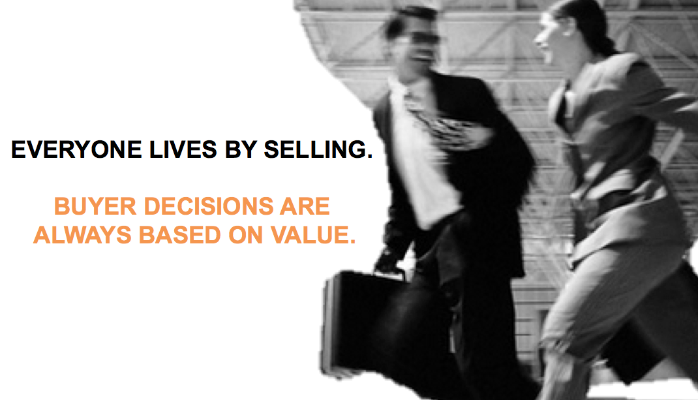 If Value Selling makes so much sense, why don’t we, and how do we? I’ll treat the how in next week’s post. For now, to get some great, immediate insights into new ways that leading technology vendors and buyers up their value selling game via powerful business cases, register now for the world’s first VSR Value Summit on 29-Feb/1-Mar in Dallas. You’ll meet over 100 practitioners, hear 22 top speakers and be a part of thousands of conversations. The Summit is produced by the Value Selling & Realization (VSR) Council, which you can also join at vsrcouncil.org. I’ll be at the Value Summit. Hope to see you there!